Matt Bertagnoli, of Lynch Isuzu Truck in Waterford, Wisc. ; Josiah Carr, of Susquehanna Isuzu Truck in West Milton, Penn. 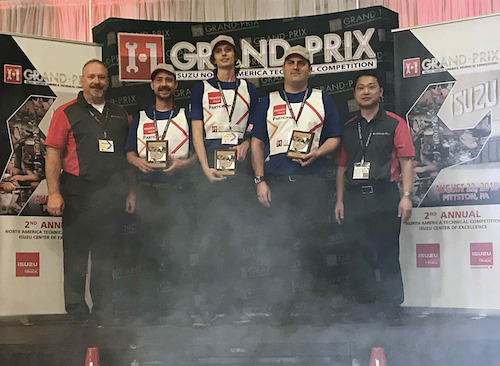 ; and Kiel Trout, of RWC Isuzu Truck Seattle, bested nine other service techs from across the U.S. and Canada in the company’s second annual North American competition for the right to to represent the U.S. in the company’s global I-1 Grand-Prix tech competition in Japan later this year. 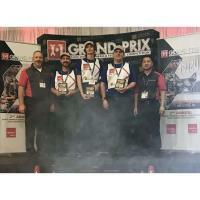 Three Isuzu North America service technicians punched their tickets Wednesday night to the company’s global tech competition. Matt Bertagnoli, of Lynch Isuzu Truck in Waterford, Wisc. ; Josiah Carr, of Susquehanna Isuzu Truck in West Milton, Penn. ; and Kiel Trout, of RWC Isuzu Truck Seattle, bested nine other service techs from across the U.S. and Canada in the company’s second annual North American competition for the right to to represent the U.S. in Isuzu’s I-1 Grand-Prix tech competition in Japan in December. Wednesday’s competition, held at the company’s Center of Excellence Training Center in Pittston, Pa., consisted of three exercises: a diagnostic and repair station, a component repair station and a written test. Bertagnoli, a veteran technician of 18 years, said Wednesday’s competition was “fun,” but adds the written portion of the testing was most difficult. Carr, despite having only six years in the field, is the veteran of the group. He was the only contestant who had been in the U.S. competition before, having missed the Top 3 cutoff last year. The U.S. contingent in December will be faced with the challenge of competing against other teams from around the globe and working on Japanese models of trucks equipped with a 24-volt electrical system, using a diagnostic platform not found in North America. “You just prepare the best you can,” says Tim McCarty, of Rush Truck Center of Atlanta who, along with Trevor Shrader, of CIT Trucks in Rockford, Ill., won the U.S. competition last year and finished runners up to Japan in the 2017 worldwide competition. Last year’s second place finish was the highest to-date of any U.S. team. Wednesday’s three timed rounds were pressure intense and both McCarty and Shrader agree that is only magnified when you step off the plane for four days in Japan with global bragging rights at stake. The key to success, they say, is to stay calm. Justin Ridings, technical training specialist for Isuzu Commercial Truck of America, says the 2018 team has the makings of something special thanks largely to their performance on the written test portion of the competition. “This is a strong group,” he says. The trio will train for three weeks leading up to the competition, with the top two going on to serve as Techs A and B. The third will serve as an alternate. Their positions as Techs A, B and C will be identified, Ridings says, by evaluating their performance in Wednesday’s competition along with their performance in the first round of practices set to begin next month. Also participating in Wednesday’s event were Brett Birdsinger, of Scoggin-Dickey Isuzu Truck in Lubbock, Texas; Candido DeLeon, of Rush Isuzu Truck in Dayton, Ohio; Frankie Elliot, of Gabrielli Isuzu Truck in Milford, Conn.; Sidney Gills, of Jacksonville (Fla.) Isuzu Truck; Curt Lewis, of Valley Isuzu Truck in Medina, Ohio; Kyle Martin, of Gold Key Isuzu Truck in Surry, British Columbia; John McLaughlin, of Palm Isuzu Truck in Fort Pierce, Fla.; Greg Miner, of Diesel Performance Isuzu Truck in Stockton, Calif.; Kiel Trout, of RWC Isuzu Truck Seattle and Jason Westlund, of Maney Isuzu Truck Duluth (Minn.).